Almost two decades in the making, Glass (the final piece to the Unbreakable trilogy) written and directed by M. Night Shyamalan is creatively shocking. It could be easy to lose focus in the storyline when making a trilogy over such a long period of time, however Shyamalan certainly connects these films seamlessly. Unbreakable, Split and Glass are three stories that correlate within a semi-realistic world that Shyamalan has created, which is unique and noteworthy in itself. However, while the plot of this final installment is interesting, it’s also where the film falters. With all of the wonderful elements put into the making of this film, it certainly isn’t perfect; Shyamalan’s strengths and weaknesses are displayed in various ways throughout Glass. The film picks up with David Dunn (Bruce Willis) on the hunt for Kevin Wendell Crumb (James McAvoy). Dunn can see into people’s lives by brushing up against them and is seemingly unbreakable, while Crumb’s split personalities hold the key to The Beast, an animal like persona out for blood. Samuel L. Jackson’s Mr. Glass is the final piece to the trio; he’s the evil genius whose bones are so brittle that they shatter to pieces when hit. 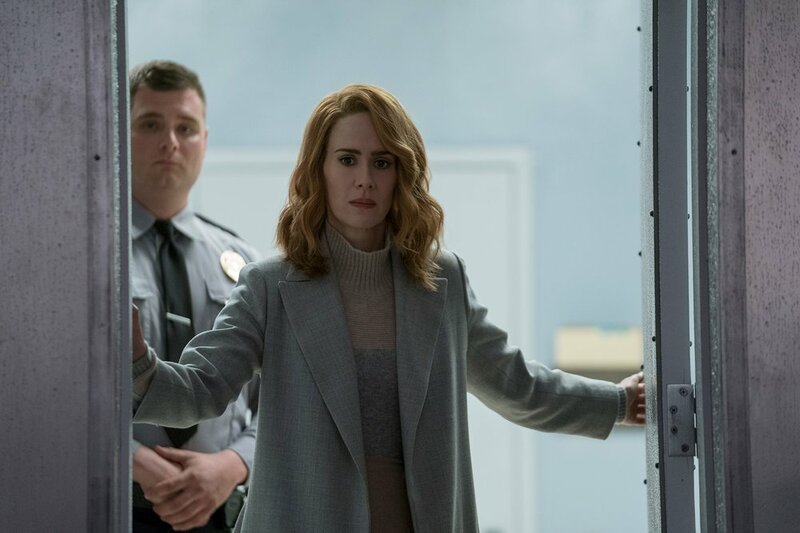 They all wind up being tossed into Dr. Ellie Staple’s (Sarah Paulson) psych hospital to be analyzed as humans who believe they are superheroes. The casting of this film couldn’t be more perfect and I would be remissed not to talk about the performance of James McAvoy (Kevin Wendell Crumb), the villain with 24 split personalities (good and bad) in one body. His performance is truly amazing to say the least, as he is able to stay in each character authentically, yet split into a new character instantly; I have never seen a performance like this one and his talent should be noted. Alongside James McAvoy, Sarah Paulson is notable. She grabs your attention almost hypnotically throughout the film. Sarah Paulson is well known for her roles in the hit series American Horror Story and her skills as a horror film actress do not go unnoticed in this film. Her character is eerie and engaging at the same time; she is an interesting addition to Shyamalan’s universe. Finally, Bruce Willis and Samuel L. Jackson- they certainly make this film and are the reason why the trilogy is as great as it is. Bruce Willis has aged but is the same action hero we all know and love. Samuel L. Jackson is a badass not to be messed with and his character Mr. Glass is exactly the same. All together the acting is great; the cast is strong- especially with previously supporting characters making a come back as well. Cinematographer Mike Gioulakis (known for: It Follows, Split and Under the Silver Lake) uses the different characters to display camera angles from their perspective. Gioulakis is brilliant when it comes to filming the multiple personalities of Kevin Wendell Crumb, he uses the camera to note the change of personality and emphasizes the new personality with camera framing. Gioulakis is the cinematographer for ⅔ of the Unbreakable trilogy so it is understandable why the cinematography is strong in Glass! Glass is entertaining but it is also disappointing. One positive thing about the plot is the seamless connection between all three films within the trilogy, which is certainly well done. However, the storyline is limiting and doesn’t allow space for much excitement in its climax. There is not much variation in scenery which becomes boring. At times there are nods towards other possible plotlines but the film decides to follow the most anticlimactic path. To say the least, the film is enjoyable because of the other strong elements but the storyline does not live up to the potential it could have. It is unfortunate that the trilogy is finalized with a film that doesn’t entirely satisfy the Unbreakable series, especially since it started off strong. Glass is not the best film, but it is not the worst. With some praiseworthy elements of in it, I highly doubt it will win any awards or turn too many heads. With that being said, I do recommend seeing the film in theaters because the visuals are incredibly well done and the actors are extremely entertaining to watch. You should especially see this film in theaters if you are a fan of the trilogy, it does answer questions but since it is an M. Night Shyamalan film, it sparks more questions as well. As a fan of the trilogy, overall the film is entertaining and it isn’t all bad, but I am definitely disappointed with the anticlimactic storyline and wish Shyamalan put more effort into the climax of the iconic trilogy.